Television Broadcasts Limited (TVB) is the first comercial wireless television in Hong Kong. It currently operates 5 TV channels, providing entertainment to 2,37 million households in Hong Kong. Furthermore, TVB is one of the top producing companies in Chinese in the world. Its programs are dubbed into several languages and are distributed to over 40 countries and more than 300 million households. 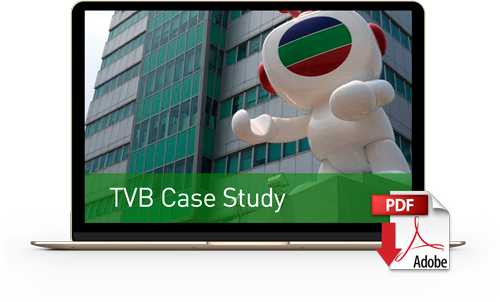 VSN’s project for TVB looked forward to improve the channel’s efficiency when ingesting, controlling the quality, transcoding and sending content to clients. The workflow designed with custom made BPs (Business Processes) allows TVB to change audio tracks, formats and resolutions during the ingest process; send content to a centralized storage once the ingest, quality control and transcoding have been completed; and even managing a double copying process, keeping both storages completely synchronized. VSN’s implementation of a service-oriented architecture platform, structured by a set of logic layers, following the recommendations of the Framework for Interoperable Media Services (FIMS). VSN’s solutions have been integrated with systems such as the Radiant Grid transcoder; Oracle archiving system; Playbox, Omneon and Harris catalogs; and also with Windows Domain to manage the security and user permits.